What Makes The Best EDC Flashlight? The term EDC stands for Every Day Carry. When we are looking for the best EDC flashlight, we have multiple things to consider. A flashlight is a very useful tool. They can be useful to find things in a dark room or they can be a powerful tool in self-defense. What is important to remember is that a flashlight that you do not have with you is a flashlight that is not useful at all. In order to have this flashlight with you at all times it needs to fit into your style and not slow you down. Size is very important, the smaller the light the easier it will be to keep with you at all times but the less useful it will be as a striking device in self-defense. The flashlight has to be durable, you want this flashlight to work when you need it. Lastly, lumen output is something that you will want to consider. Size is probably the most important factor in a EDC flashlight. You need to first consider how you are going to carry the flashlight. Are you going to keep it in your pocket, on your belt, in a holster, or in a purse? There are nice flashlights that fit on a keychain, flashlights that are the shape of pens, and there are larger lights that come with pocket clips. The size of the flashlight is mostly dependent on what battery the flashlight uses. Some micro flashlights use watch type batteries but most flashlights use larger batteries like AA, AAA, CR123A or CR2 batteries. We have dedicated buyers guides for most battery types also here is the buyers guide for AAA flashlights. There are benefits to each battery type, it is easy to find the standard size batteries in rechargeable options but the specialized batteries offer higher performance. As far as self-defense goes the amount of light is very important. If you can see everything in your environment and you can blind an attacker, you will have a have a great advantage over any attacker. The second use of a flashlight in self-defense is as a striking tool – slightly larger flashlights will work better for this. You need to first decide what size will be the best EDC flashlight for you. If you are carrying a flashlight with you everyday, it will have to survive a beating. This is the reason you do not want a cheap flashlight. 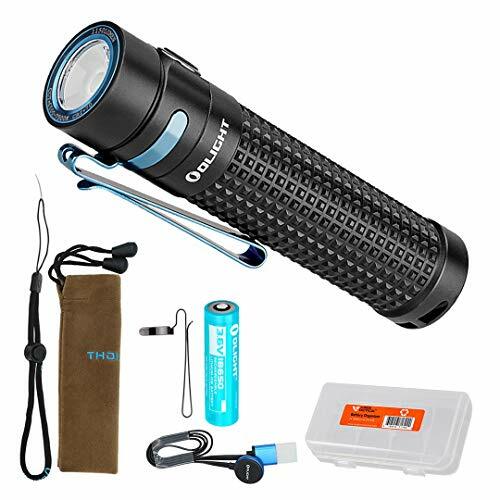 You want a flashlight that can take a beating everyday and still work when you need it, a flashlight that you could count on in a survival situation. Materials are important along with things like being shock resistant, waterproof, and having a lens that is shatterproof and scratch resistant. The most commonly used material for tactical flashlights is anodized aluminum, specifically Type III hard anodized. Other commonly used materials are titanium and stainless steel which are both more expensive than anodized aluminum. All three of these materials are very strong and durable. Titanium has the best weight to strength ratio, being as strong as steel but 45% lighter and twice as strong as aluminum while only being 60% heavier. Stainless steel is very strong but it is also the heaviest. Aluminum is a nice middle ground of weight, durability and cost. Part of the ANSI FL1 standards includes impact resistance. This measurement is the height in meters that the flashlight could be dropped from onto cured concrete and still work perfectly without any cracks or breaks. Being shock resistant also focuses on the type of light emitter that is used. LED lights have taken over the flashlight market largely because they are cheap, have a longer lifespan, and are shock resistant. Incandescent bulbs were expensive, hard to replace, and not shock resistant. Another one of the ANSI FL1 standards is being waterproof, this is the IPX rating. The three IPX Ratings that frequently show up on flashlight are IPX4, IPX7, and IPX8. IPX4 means that the flashlight is splash resistant. IPX4 is probably fine if you are in an urban environment and this is just in your pocket, just don’t forget it in the wash. IPX7 means that the flashlight can be submerged up to one meter for 30 minutes. Lastly IPX8 means that the flashlight can be submerged below one meter (manufacturer states) continuously. The most important part about a flashlight is obviously the light that comes out of it. You want a light that will give you a tactical advantage in a self-defense situation and one that will be able to throw the light a far beam distance in a dark parking lot or alley. A minimum of 60 Lumens is recommended to be able to disorient an attacker but 120 Lumens is needed to temporarily blind someone. 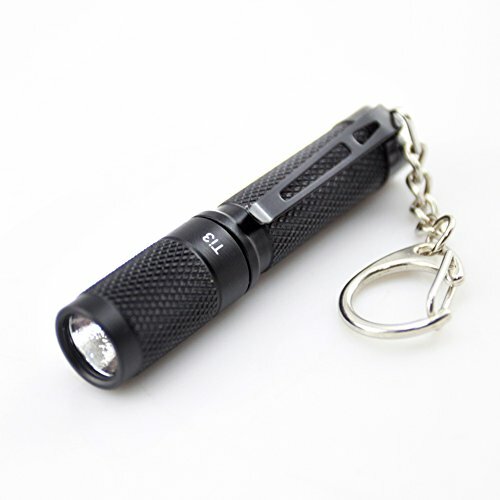 Keychain flashlights come in two main forms, the first is the flat single led version that uses a watch type battery which is called a button cell. The second uses a single AAA battery and has a keychain loop on the end of the body. Due to power output of the watch batteries they do not get very bright but they have extreme portability and durability so they deserve to be mentioned. If you are looking for an EDC style of light that can be carried on a lanyard or even a keychain, the Fenix UCO2SS is the perfect choice for you. 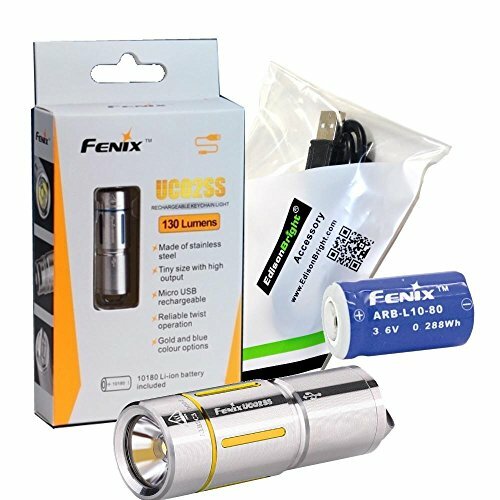 Measuring a mere 1.7 inches long with a weight of 0.65 ounces, the Fenix UCO2SS can easily be stored or carried in your pocket or glove box. The single 10180 button cell Li-ion battery is fully rechargeable, but can also be replaced if needed. Recharging the battery involves unscrewing the head of the light from the body to plug in a Micro USB cable. The battery is fully recharged within 45 minutes. The Fenix UCO2SS features a CREE XP-G2 S2 white LED with a 50,000 hour lifespan. Users will be able to switch between two lighting modes with the lowest setting emitting 10 lumens of light, while the highest setting will emit 130 lumens. At 1340 lumens the light offers a peak beam intensity of 570 candelas and will reach up to 158 feet. Switching between high and low modes is done by twisting the head of the light. With an IP68 rating the light is dust proof and waterproof up to 2 meters. If you are looking for an EDC style of light that offers an even lower lumen setting than the Fenix UC02SS, you need to take a close look at the Olight I1R EOS. The Olight I1R EOS offers users a small and lightweight design; the little light is shorter and slimmer than an AAA battery. 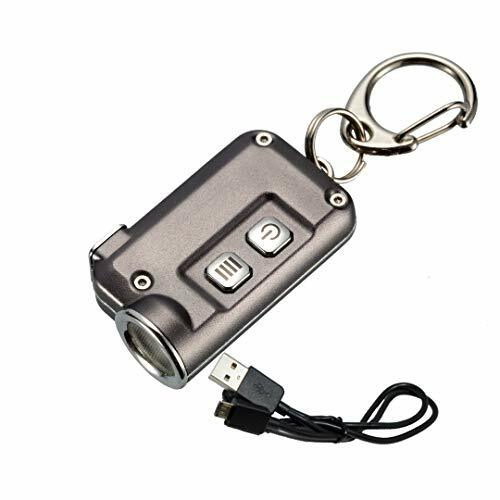 Weighing in at just 0.42 ounces the small light is ideal for carrying on key chains and lanyards. Powered by a single Li-ion button cellfs battery the Olight I1R EOS is fully rechargeable via a built-in micro USB charging port. The port can be accessed by removing the lens housing and a full recharge takes 1 hour and 15 minutes. A charging indicator light will flash red or green to alert you of the light’s charging status. Using a Philips Luxeon TX LED paired with a TIR optic lens, the Olight I1R EOS provides a soft, balanced beam with two different output modes. On its highest setting the Olight I1R emits 130 lumens, while on its lowest setting users will only receive 5 lumens of light. The two output modes can be accessed by twisting the head. With an IPX-8 rating the Olight I1R EOS can be fully submerged in up to 2 meters of water for a period of 30 minutes. If you are looking for an EDC style light that is rechargeable and small and durable enough for your keychain, look no further than the Manker LAD. The Manker LAD features a 219C LED featuring a high CRI (Color Rendering Index) number for the best color display. The powerful LED has the ability to emit a maximum of 230 lumens for a period of 30 minutes before the battery needs recharging. The keychain style light also features a 2X Red Straw HAT LED with the ability to emit 1 lumen of red light for up to 100 hours. With the Manker LAD users have the choice between three brightness levels, plus an additional strobe mode. With the Manker LAD users will enjoy the flat design, as it allows for a better fit inside of pockets or on key chains. The light measures 2 inches in length, so it blends in nicely with the rest of your keys. 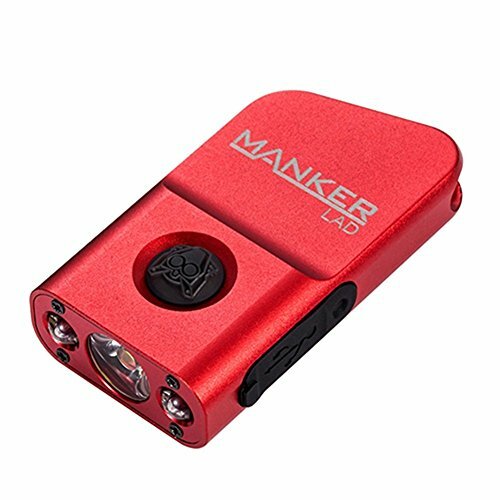 The Manker LAD is made from aluminum alloy and offers a built-in rechargeable polymer lithium battery. The battery takes 70 minutes to recharge and can be used with any USB charging device. The button on the Manker LAD has two purposes. The button switch powers the light on and off, as well as allows users to cycle through the various modes. The button switch also serves as a charging indicator. The Nitecore TINI comes in as a runner up in our best EDC rechargeable keychain light and is a proud member of the Nitecore’s T series of lights. The size, design, and weight of the Nitecore TINI makes this key chain light an excellent choice for an EDC light, as it allows you to always have your light with you when you need it most. Measuring just 1.7 inches in length the light is about the same length as most keys, so it will easily blend in on any key chain. With a CREE XP-G2 S# LED with a 70 yard throw, the Nitecore TINI has the ability to emit up to 380 lumens in its Turbo mode. The Nitecore TINI offers four brightness levels, so you can select the right mode for your current lighting situation. The rechargeable built-in Li-ion battery can be recharged using the charging port and a variety of power sources. An indicator light alerts users to the battery’s power levels and provides charging status information to all users. Accessing the charging indicator light is done by tapping on the operating switches while the light is powered off. 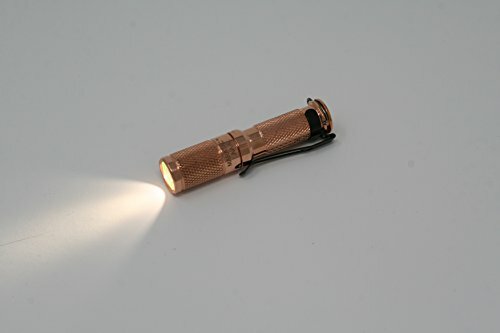 If you are in the market for the best EDC light that is powered by a single AAA battery, look no further than the Maratac Copper. Featuring a Nichia 219C LED with a 50,000 hour lifespan users will have one of the brightest and newest emitters on the market that is capable of bringing out nature’s true colors. Like their CREE counterpart, these new emitters also offer ultra-low thermal resistance. An orange peel reflector is paired with an AR coated lens to provide a smooth and steady beam. Although you can use an ordinary alkaline AAA battery, the manufacturer strongly discourages it as they have a higher risk of leaking compared to rechargeable AAA batteries. The Maratac Copper offers users three brightness levels with the highest setting offering 15 lumens and the lowest 1.5 lumens. One of the most talked about features with the Maratac Copper is the setting order of medium/low/high. This setting order has long been requested as most users use the medium setting, so they want the light to start up in the most used setting. The body of the Maratac Copper is made from an ultra conductive C360 Free Machining Brass. 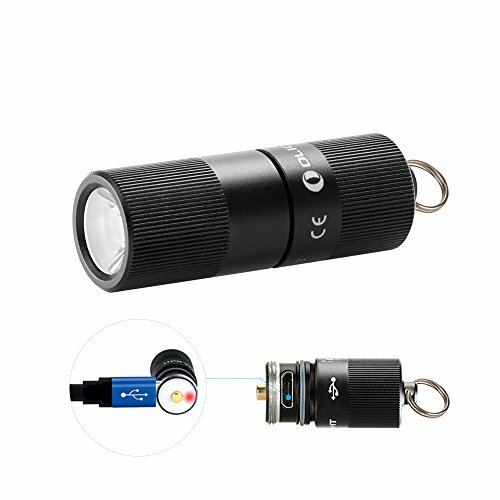 If you need a small, keychain style light that is also quite powerful, take a look at the Thrunite Ti3. Not only is this little light one of the brightest for its size, it is also reasonably priced. The Thrunite Ti3 features a CREE XP-G2 R5 LED that offers a 20 year lifespan, so you know this light and all its components are built to last. Made from aircraft grade aluminum with an anti-abrasive finish the light is built to withstand every day use. Our recommendation for the Thrunite Ti3 offers a natural white light, but Thrunite offers a Cool white version too. The small, Thrunite Ti3 is simple to use, which only adds to its charm. The Ti3 offers one handed use with a simple twist switch design. The Thrunite Ti3 offers four different brightness modes and is powered by a single AAA battery. One of the four brightness modes included is a strobe mode, making the light an even better choice for EDC. The Thrunite Ti3 comes complete with a pocket clip and a key ring so you can chose your preferred carrying method. If you are looking for a small, but powerful EDC style of light that uses a AA battery, you need to look closer at the Zebralight SC53c. Featuring a CREE XP-L2 LED the Zebralight SC53c offers a neutral white light with a high CRI. The beam provided by the LED offers an 80 degree spill with a 12 degree hot spot, which is more than adequate to help light up your peripheral vision. Users can select from 3 main brightness levels, but each of the main levels can be further programmed to offer even more brightness settings. The Zebralight SC53c can emit a maximum of 285 lumens on it’s a highest setting, while its lowest setting can be programmed to emit a mere 0.01 lumens. All of this is done using a single AA battery, which can be an ordinary alkaline, lithium, or NiMH. The manufacturer strongly recommends using Enoloop or Eneloop Pro batteries. With the Zebralight SC53c users are treated to a smart user interface, one that is designed to provide quick and easy access to all brightness levels, including beacon and strobe modes. The light is entirely controlled by a durable electronic soft-touch switch located on the aluminum body of the light. The Zebralight SC53c features a battery capacity indicator that will alert users to low battery levels, while the light is on or off. Each of the brightness levels are current regulated, but to save battery power the light will automatically step down from high to medium and medium to low when battery power is low. If you need an EDC light that offers excellent performance using a single AA battery, look no further than the Lumintop EDC05. With the Lumintop EDC05 users will get the chance to experience a CREE XP-L LED and have the choice between a neutral and cool white light. Users will enjoy the fact that the Lumintop EDC05 can use two different styles of batteries either an alkaline AA or a 14500 rechargeable Li-ion battery. Choice of battery will affect lumen output and run times. With the 14500 battery you get brighter lumens, but shorter run times than the alkaline AA battery. The user friendly interface offers one handed operation via a soft touch electronic switch. The switch controls all aspects of the Lumintop EDC05 and allows users to switch between all four brightness modes, as well as strobe, beacon, and SOS modes. The magnetic tail cap allows for tail standing giving you hands free light were needed. The small light is made from aerospace-grade aluminum and offers a type HAII anti-abrasive finish. The heat dissipation fin protects the light from overheating. The knurling provides a firm grip and the protection ring offers extra protection from accidental drops. 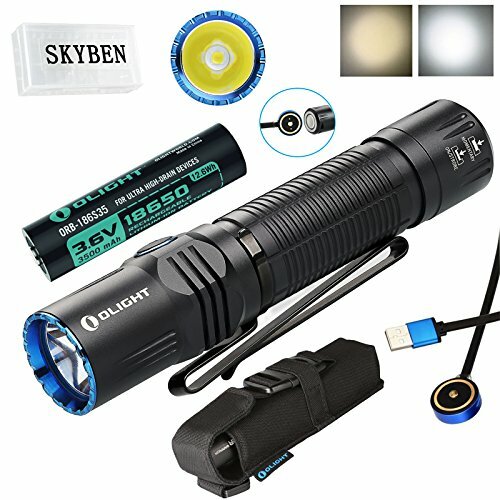 The Olight S1R II is the updated version of the S1R Baton. This second generation EDC light offers some pretty impressive upgrades at an affordable price. One of the most talked about improvements with the Olight S1R II is the lumen output, the 2nd generation light has the ability to emit 1000 lumens for a period of 1.5 minutes before stepping down to 300 lumens. The Olight S1R II utilizes a high performance CW LED that is paired with a TIR optic lens to produce a beam with amazing clarity and a balanced hot spot. The small squared textured milling along the body of the light offers an excellent grip and a comfortable feel. This new generation of light is the first in the Olight line to use a single IMR16340 rechargeable battery with a side-switch, but also has the ability to accept regular RCR123A and CR123A batteries. The built in recharge is only available with the IMR16340 battery. Using a RCR123A or a CR123A will limit the lumens to 60, while the IMR16340 offers an automatic step down from 1000 to 300 lumens after about 90 seconds. Another improvement to the Olight S1R II is the pocket clip, which is now a true 2-way pocket clip. The clip can rotate around the body of the light and offers a tight fit, but is removable. A three color power level indicator light is located in the center of the side switch and starts working once the light is turned on. 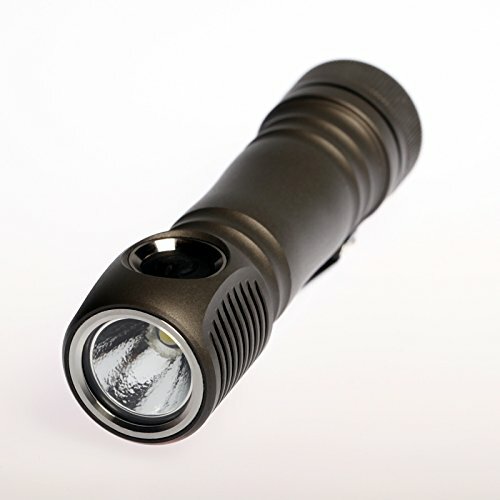 The Fenix E18R offers a compact and lightweight light that is perfect for an EDC style of light. 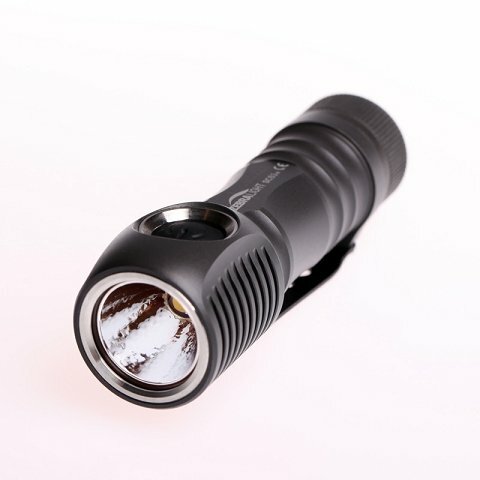 The Fenix E18R features a CREE XP-L HI LED that has the ability to emit a maximum of 750 lumens for up to 45 minutes. The Fenix E18R offers a one-switch control that is located on the neck of the light in the form of a side one-switch. The switch allows users to switch between 4 brightness modes, as well as a strobe mode. Users have the option of using a 16340 Li-ion battery that comes included with the light or a single CR123A Lithium battery. Only the included 16340 battery can be recharged via the magnetic charging port with the specialized magnetic charging cable. With a Type HAIII hard-anodized anti-abrasive finish the body of the Fenix E18R offers excellent protection from wear and scratches. The highly durable and oxidation resistance body offers a IP68 rating allowing the light to be fully submerged in water for up to 30 minutes without incurring any damage. The strong and durable body also offers impact protection up to 3.28 feet. The Fenix E18R features a moveable body clip and a magnetic tail cap for hands free use and carrying options. To preserve the battery life the Fenix E18R offers a lockout mode and other safety protections, including a regulated output, overheating protection, and reverse polarity protection. Using a CREE XHP35 Cool White LED the Zebralight SC64 offers PID thermal regulated outputs for the three highest output levels. The Zebralight SC64 provides users with three main brightness levels, with each main level having the ability to be programmed further with two sublevels. The second sub-level can also be programmed further. This programming ability provides users with numerous brightness levels to choose from ensuring the right amount of light is available regardless of the task at hand. Powered by a single unprotected 18650 rechargeable battery, the Zebralight SC64 can emit a maximum of 1616 lumens for a period of 45 minutes. A battery capacity indictor light will flash 1 to 4 times to inform you of how much power is left in the battery. Once the capacity is low the light will automatically step down from high to medium and medium to low. The smart user interface is controlled via a durable electronic soft-touch switch and provides access to all brightness modes, including beacon and strobe modes. The durable natural hard anodized finish offers scratch and wear protection. An IPX8 rating allows the light to be submersed in up to 2 meters of water for 30 minutes without incurring any permanent damage. An upgraded version of the Olight S2R, the S2R Baton II offers plenty of upgraded features and improvements. 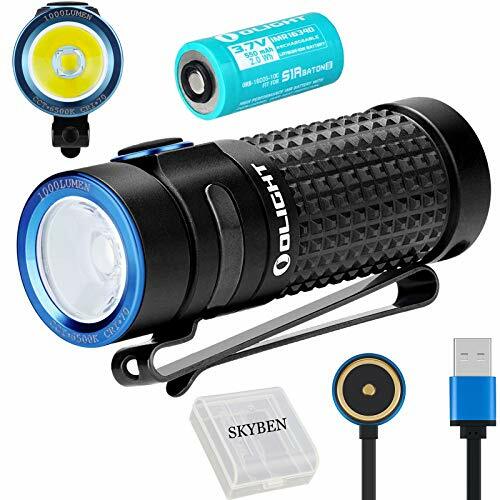 The Olight S2R Baton II uses an upgraded TIR lens with a Luminus SST-40 LED to emit a maximum of 1150 lumens for 2 minutes. Once the 2 minutes is up the light will automatically step down to 400 lumens to help preserve battery life and to prevent overheating. The super bright light has the ability to throw a perfectly balanced beam for 147 yards. The Olight S2R Baton II offers users 5 brightness levels, plus a strobe mode for emergencies. Coming in shorter and lighter than the original model, the Olight S2R Baton II is easier to grip and carry. The light comes with two pocket clips, a blue and black, along with a pouch and lanyard for additional carrying options. Using a single 18650 lithium ion battery the Olight S2R Baton II can charge faster than the original version. The new model utilizes a MCC II magnetic charging cable that will connect to the magnetic tail cap for charging. The three color power indicator light located underneath the side switch will alter you as to when the battery needs to be charged. The rechargeable battery can last for up to 60 days when used on its lowest mode. The SureFire EDCL1-T is an upgraded version of SureFire’s EB1 Backup light, which is also SureFire’s best selling light. 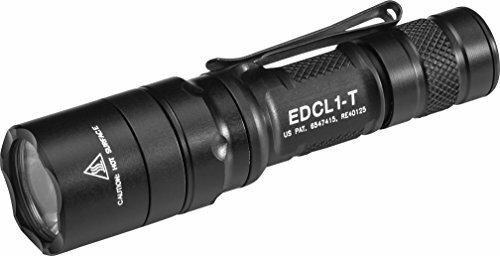 The SureFire EDCL1-T offers users an indestructible LED that is regulated to ensure optimal output and runtime. The high output LED is paired with a TIR lens to offer a versatile beam that provides plenty of throw. The beam of the Surefire EDCL1-T is optimized for everyday carry abilities, as well as situational awareness. For the perfect every day carry option the SureFire EDCL1-T offers two output levels with a maximum output of 500 lumens for 1 hour and 5 lumens for 45 hours. The SureFire EDCL1-T is made from a high-strength aerospace aluminum with a MI-Spec hard anodized finish for superior durability. The body and tail cap offer knurling for a better grip. The SureFire EDCL1-T is controlled by a tail cap switch. Twisting the tail cap allows you to power the light on and off, while a full press selects high output and a partial press turns on low. A two-way clip allows the SureFire EDCL1-T to be carried either bezel up or down. The light is powered by a single high energy CR123A battery. 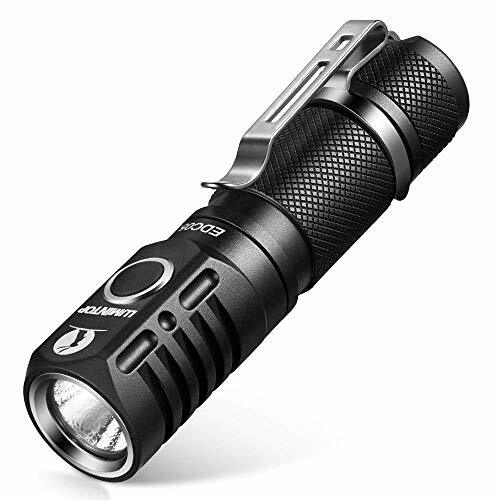 The Olight M2R Warrior is Olight’s newest rechargeable flashlight and is considered to be one of the most powerful pocket friendly tactical lights. The Olight M2R Warrior uses an XHP35 HD LED and has the ability to emit a maximum of 1500 lumens. The light is powered by a high discharge rate 18650 battery, but is compatible with all conventional 18650 batteries. In order to reach the 1500 lumens users must use the 18650 battery that comes with the light or one with a discharge current of over 6A anything less will result in the max output dropping to 1000 lumens. The rechargeable battery that comes with the Olight M2R Warrior can be recharged using the Olight Micro-Dok II or above or the included magnetic charging cable. The Olight M2R Warrior offers ergonomic knurling allows for a firm, comfortable grip. The design of the flashlight allows users to easily operate the tail switch without even looking, as the tail switch offers a smooth and barrier-less tail cap. The tail switch allows users to select between 6 different modes, including a momentary or constant turbo mode. Turbo mode will run for 3 minutes before stepping down to 700 lumens to prevent damage from overheating. An enhanced tactical mode allows users to access turbo mode with a single click. The pocket clip is detachable allowing users to carry the light in either direction. The light also offers a lanyard hole for other carrying options. We have done lots of research to find the best batteries for your EDC flashlights. Not all batteries are created equal. Getting a high quality battery can dramatically increase your runtime and brightness. Below are the top batteries by type, all you need to do is decide if you want to use rechargeable batteries or primary (non-rechargeable) batteries. A real favorite among the flashlight crowd, both at candlepowerforum and budgetlightforum, is the Eneloop Ni-MH AA and Eneloop Ni-MH AAA rechargeable batteries. The eneloop batteries have a low self discharge, have an above average voltage under load, and can withstand battery neglect better than other brands. If you are going to spend money on a good flashlight and batteries then you should also get a good charger to take care of those batteries. Our favorite for Ni-MH is the La Crosse BC-700. For primary batteries the best are the Energizer L91(AA) and L92(AAA) Lithium batteries. These are not Li-ion rechargeable batteries! The Energizer batteries have a longer run time and more output than standard alkaline batteries, the only downside is that they are more expensive. CR123A are tiny Lithium batteries. These batteries put out 3 Volts as opposed to the 1.2-1.7 volts of the standard sized batteries. Flashlights that are specifically designed to handle Lithium batteries can run the LED bulb to much higher lumens. The key to CR123A batteries is to get the from a US manufacturer, all of the US manufacturers are producing batteries that are very similar in quality. Our favorites are the Streamlight CR123A batteries since they are from a high quality flashlight manufacturer and they have a reputation to uphold i the flashlight community. I hope that you were able to find all of the information that you needed to choose the best EDC flashlight for you. EDC is really dependent on what you are willing to actually carry with you everyday. The best flashlight is the one that you have with you all of the time. 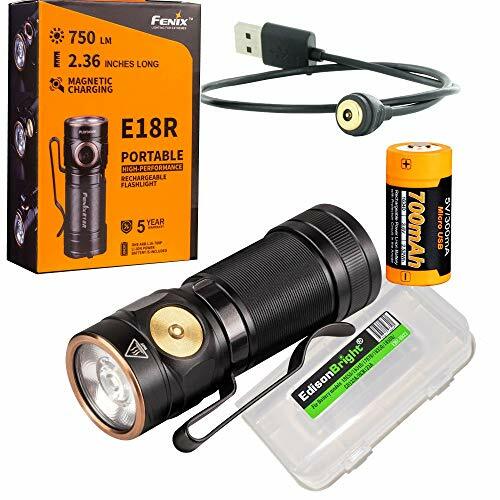 If you like any of the flashlights that you see in this article or in any of our other articles, please click one of the Buy Now buttons to make your purchase on Amazon. As an Amazon affiliate we make a small commission off any purchase made from a click through from our website, which is how we are able to provide you with these amazing informative articles. Clicking through from our website will not cause you to pay more on Amazon, as the price is the same if you go to Amazon directly – the difference is the commission that we receive. Please take a look at our other Best Flashlight articles. If you are new to flashlights and are not sure about some of the lingo here please visit our flashlight buyers guide.